The following settings are only applicable when the Original S&OP add-on is enabled. When Advanced Planning is applied, those noted with "Not Applicable with Advanced Planning" will not apply. Fiscal Year Start Week: Sets the day your companies fiscal year starts. The year is not critical to keep up to date in this setting. 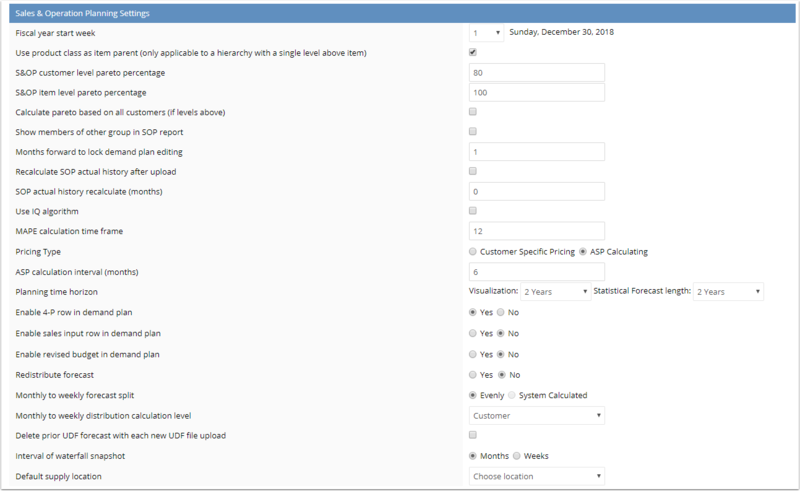 Monthly Grouping Type: Sets the basis of how monthly sales are aggregated. Options are Calendar month, 4-4-5 fiscal calendar, and 5-4-4 fiscal calendar. Months Forward to Lock Demand Plan Editing: A user defined number of months forward where demand plans edits are not allowed. Setting a value of 1 locks the current month. MAPE calculation time frame: The number of rolling backward months to use to calculate MAPE, WMAPE, and VAF. Planning time horizon: Two years generates a statistical forecast for the current year and all of next fiscal year. Three years does the same but adds an additional year beyond the next fiscal year. Monthly to weekly forecast split: An automated approach to splitting a monthly demand plan to weekly buckets during the demand translation process. The default approach is even distribution where a monthly forecast is evenly split in weekly buckets. System Calculated calculates the weekly distribution within the months to split the forecast based on a historical seasonal distribution. An example of this is when shipments follow a hockey stick approach. Monthly to weekly distribution calculation level: The level where the monthly to weekly split is calculated. Delete prior UDF forecast with each new UDF file upload: This setting removes the prior UDF if the customer / item line is not included in the file. The value will default to the statistical forecast. Interval waterfall snapshot: Options are months or weeks. Determines the basis of how the waterfall is presented when weekly bucketed forecasting is enabled. Supply plan additional target: By default the supply plan target is set as a rolling 12 month target. The user may select an interim target such as end of fiscal year to allow the S&OP planning calculations to be fixed against a specific point in time. Default supply location: Sets the default supply location for all items if no such supply location exists for the item. Level load: Provides the option to level load the supply relative to demand, or to chase demand (increase supply with rising demand or decrease supply with falling demand). This option is available at the item level to make the setting item specific. Level load safety stock tolerance: % to allow an items supply plan projected on hand to move into the safety stock quantity before triggering an adjustment. Only applicable when level loading is enabled.